Joe DiFabio had the credentials one would expect from an elite Cardinals prospect. In high school, he was mentored by a coach who would become one of the best in his profession. In college, DiFabio sharpened his skills playing for a coach who had excelled as a pitcher in the big leagues. As a professional, though, DiFabio wasn’t quite good enough to pitch for the Cardinals. On June 8, 1965, in the first amateur draft held by big-league baseball, the Cardinals made DiFabio their No. 1 pick. A right-handed pitcher, DiFabio achieved success at multiple levels of the Cardinals’ minor-league system, but never pitched a game in the majors. DiFabio developed into a standout pitcher at Cranford High School in New Jersey. His coach was Hubie Brown, who also was the assistant basketball coach. After leaving Cranford, Brown built a career in basketball. He twice was named NBA Coach of the Year and was elected to the Naismith Memorial Basketball Hall of Fame. After graduating from high school, DiFabio continued his baseball career at Delta State in Mississippi, where Boo Ferriss was the baseball coach. In 1946, Ferriss had a 25-6 record for the Red Sox and was the winning pitcher in Game 3 of the World Series against the Cardinals. In 1965, his junior year at Delta State, DiFabio was 7-0 with an 0.55 ERA. He struck out 97 in 65 innings, pitched three one-hitters and yielded 28 hits all season. Buddy Lewis, a former third baseman and outfielder for the Senators, scouted DiFabio for the Cardinals and recommended him. Until 1965, an amateur player could sign with any big-league organization that made an offer. That changed when Major League Baseball started its draft of amateur players. As defending champions, the Cardinals chose last among the 20 big-league clubs in the first round and took DiFabio. Signed at the end of June, DiFabio was sent by the Cardinals to their Class AA Tulsa team in the Texas League. Playing for manager Vern Rapp, DiFabio made seven appearances and was 0-2 with a 7.88 ERA. The Cardinals ordered him to improve his physical conditioning before the 1966 season. “He’s about 5-foot-10 and weighed over 220,” Chief Bender, the Cardinals’ farm director, told The Sporting News. DiFabio got his weight down to 197 pounds in 1966, Bender said. Pitching for Class A Cedar Rapids of the Midwest League, DiFabio was 11-3 with a 1.86 ERA in 17 starts. “He had a good year at Cedar Rapids after he was unable to get in shape in 1965,” Bender said. In 1968, DiFabio had another good year. At Class AA Arkansas of the Texas League, he was 13-6 with a 2.17 ERA in 24 starts for Rapp. Meanwhile, pitchers such as Steve Carlton, Nelson Briles and Larry Jaster _ all of whom were signed by the Cardinals as amateur free agents in the years before a draft _ were advancing through the organization and receiving promotions to St. Louis. Major League Baseball expanded from 20 to 24 teams in 1969, opening opportunities for more players to get into the big leagues, but no one chose DiFabio. Assigned to Arkansas in 1970, DiFabio was 10-7 with a 3.26 ERA in 26 games for manager Ken Boyer. Still, the Cardinals didn’t call. After the 1970 season, DiFabio and the Cardinals parted ways and he signed with the Reds organization. In 1971, pitching for Rapp at Class AAA Indianapolis, DiFabio was 0-2 with a 15.00 ERA in two starts before he called it quits. In seven minor-league seasons (1965-71), DiFabio was 45-34 with a 3.28 ERA. DiFabio had continued his education in the baseball off-seasons, earning a bachelor’s degree and a master’s degree from Delta State. Of the 20 selections in the first round of the 1965 draft, seven didn’t play in the major leagues. The Cardinals chose 60 players in the 1965 draft. One of those _ pitcher Harry Parker, a fourth-round pick _ played for the Cardinals. Five other Cardinals 1965 draft picks got to the big leagues with other teams: pitcher Dan McGinn, 21st round; pitcher Jerry Robertson, 27th round; shortstop Rich Hacker, 39th round; pitcher Pete Hamm, 41st round; and second baseman John Sipin, 55th round. Hacker also was a Cardinals coach on the staff of manager Whitey Herzog from 1986-90. 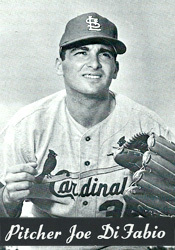 Like DiFabio, neither the Cardinals’ 1965 second-round choice, first baseman Terry Milani, nor their third-round selection, outfielder Billy Wolff, played in the big leagues. Yes, it is. Stories like this make me appreciate how difficult and special it is to reach the big leagues. Thanks for reading.